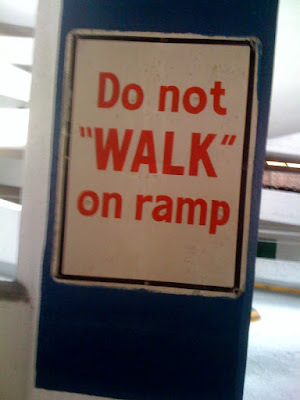 The “Blog” of “Unnecessary” Quotation Marks: like an egyptian? Submitter Joe saw this in a parking garage and quips, "I guess there's more than one way to go down a ramp." What it really means is that you can walk, but aren't permitted to run, skip, or hop. Where does crawling fit in? Wheeeee! Time to get out my rollerblades!